Last week I went to visit my grandparents in New Orleans. I had to make a point to stop by one of the local craft breweries, and there just so happened to be one very close to where we were shopping one day. 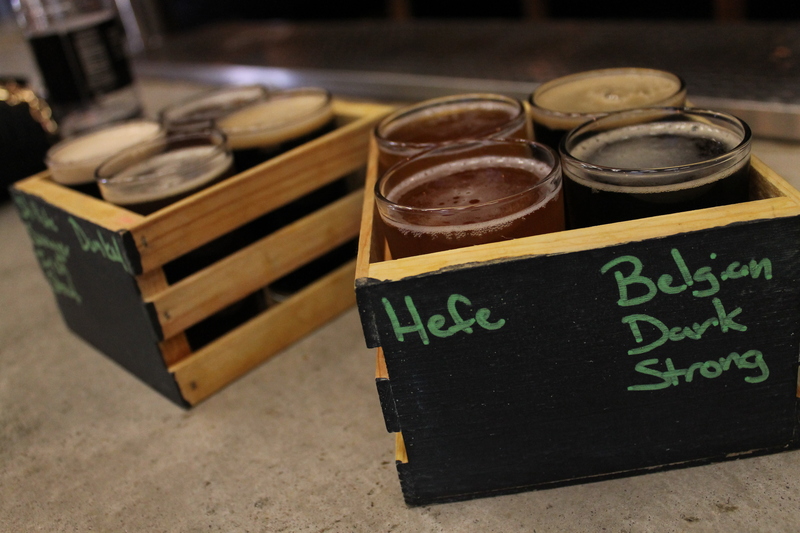 The NOLA Brewing Company is two blocks away from Magazine Street off Tchoupitoulas Street. (I’d like to hear you try to pronounce that if you’re not familiar with the area). It had a two story taproom with rooftop access and a view of the Mississippi River. They had the most expensive flights i’ve come across at $10 for four pours. I went with a raspberry sour called Desire, a pineapple habanero IPA, the Irish Channel Stout, and a porter that I forget the name of. I’ve learned from the few sours i’ve tried that i’m not a fan, but this was the best i’ve tried. They kind of fall into the same category as cider for me. I’m just not able to drink more than one at at time and they just don’t taste like beer. The pineapple habanero wasn’t very pinapple-y or spicy. The Irish Channel Stout wasn’t my favorite stout ever but I decided to take a 4 pack of pint cans home so I could bring a piece of New Orleans with me, which I think was $10. The taproom had a small menu, which I didn’t really pay attention to since we were full from Juan’s Flying Burrito. Now THAT is some good eats. The beer was mediocre and the bartender was meh. If I lived there i’m not gunna lie, i’d probably go back to try more since they had i’d guess close to 20 beers on tap, but it wouldn’t be my first choice. Worth popping your head in if you’re area, but definitely not the 12 hour drive from Tampa. 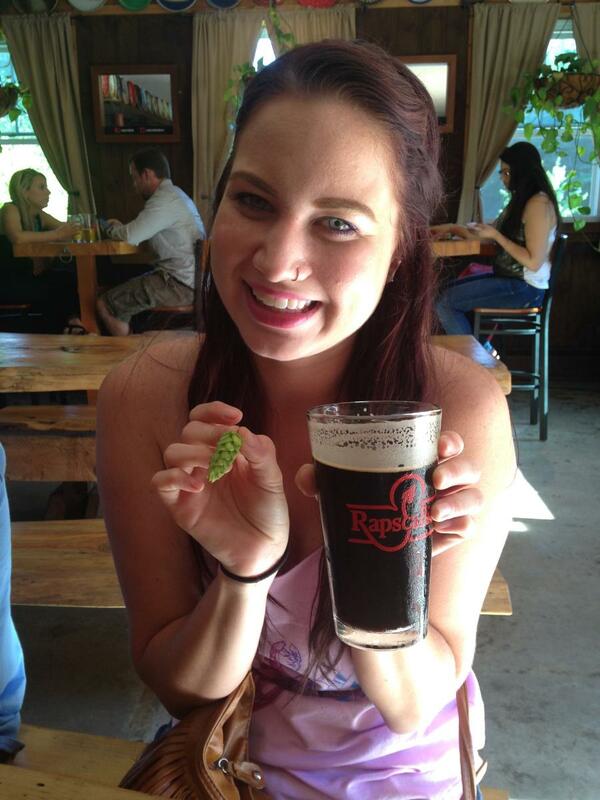 I forgot to blog about my trip to the Cigar City Brewpub in Tampa before I went on vacation last week. I’m getting pretty bad at this. I’ve had a few of Cigar City’s beers before and had even visited the taproom a few years back, but it had been awhile so I went with a flight to try more than one. I went with the hard cider, Maduro Brown Ale, Space Race and Barley Berry Jam. The only reason I know this, by the way, is not from superior memory, but from this awesome app on my phone called Untappd. It’s how I “check-in” or log my new beers. It’s like Facebook, but for you and your beer drinking friends. But that’s another post. Anyways, I remember liking them all, the Space Race the most, which I think was a stout. But again not the biggest fan of the cider. Just too sweet for my taste. They had a ton of beers on tap so there is definitely something for everyone. No, I don’t remember how much the flight cost. The dinner menu had a good variety and I went with the empanada of the day, which happened to be something with buffalo chicken when I went. It was pretty good; i’d eat it again. Nicole was a total copycat and got the same thing, but our other two friends went with the flank steak, which looked delicious, and the mac n cheese with ropa vieja, which I can attest was delicious. We had an appetizer of caprese salad, which was fresh and filling. Overall for the price it was a good deal. The decorations inside were cute too with use of beer barrels, bottles, cans, etc in all the furniture and walls. I don’t think i’d drive that far again just for the beer, but if you’re in the area it’s definitely worth stopping by. While I was vising family in Massachusetts, I had the opportunity to check out two local breweries. 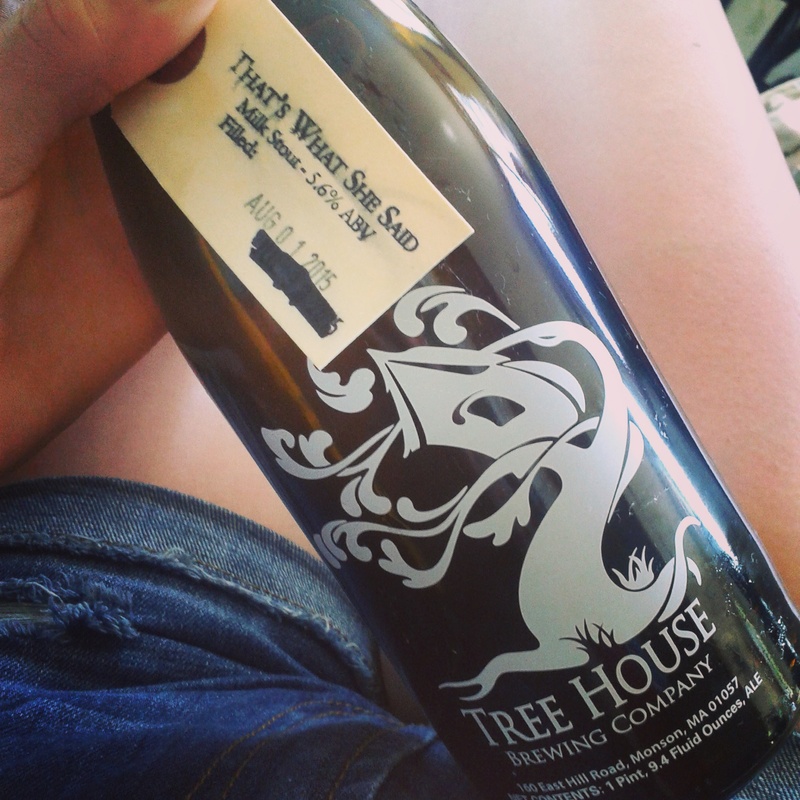 Tree House Brewing Co. in Monson is not a place you go to drink beer, but a place you go to buy beer. And the locals love it. We had to come back a few days after we tried the first time because it was a 2 hour wait. You basically go there to buy a growler and fill it, bring your growler to be filled, or buy some cans or swag. You can not drink on the premises but they do have corn hole outside for patrons while they wait 30 minutes for their growler to be filled. I think it was a little over-hyped for the few beers they actually had on tap, but they were good. I bought a few cans of their current IPA Julius and a growler of That’s What She Said Milk Stout. Rapscallion Brewery in Fiskdale is on a cute farm in an old barn building at Hyland Orchard and it just so happened that when we went they were setting up for a wedding in their event facility. It was really cool to see hops growing outside like vines since you don’t usually see that in Florida’s climate. They offer a sampler which includes four tastes for $8. Their tap list was much longer than Tree House with about 12 brews available where the latter had about 4. Everything from a honey ale to a super IPA was available. After my sampler tray I went with a pint of the Black IPA which was a interested stout/IPA blend that I really enjoyed. These scenic spots are definitely worth checking out if you’re ever in the MA area. Tags: MA breweries, Rapscallion Brewing, Tree House Brewing Co. This is currently my favorite beer. I will say it was better fresh on tap from The Stein & Vine, but the bottle will do just fine. Southern Tier’s Choklat Oranj is the only st out that i’ve tasted that actually tastes like dark chocolate. Most stouts will give you the essense or notes or dark chocolate, but this one has an after taste that makes you feel like you’ve just eaten a square from a dark chocolate bar. It is so good I went out to the Craft Beer Cellar and bought one of the large bottles for $12. At 10% it’s not too bitter compared to some of the stouts i’ve had lately. The bottle says it is brewed with chocolate and orange peels. Grab one of these while you can. 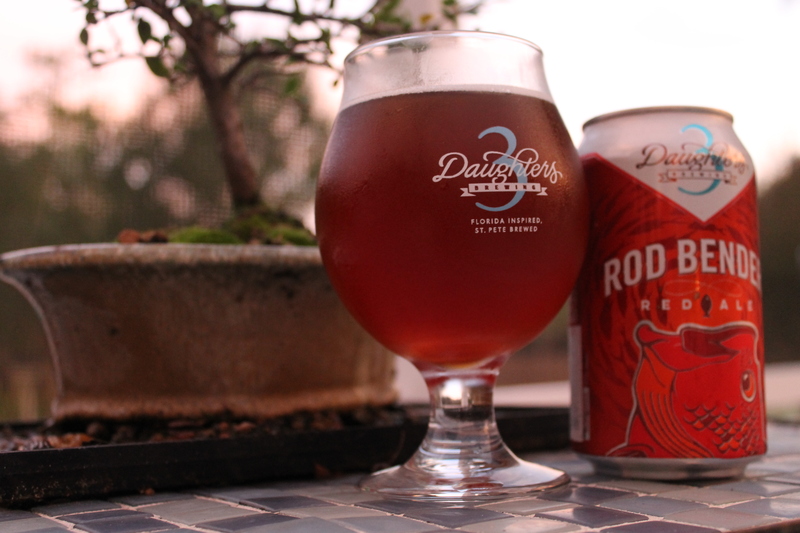 It would make a great dessert beer, especially with some vanilla ice cream. 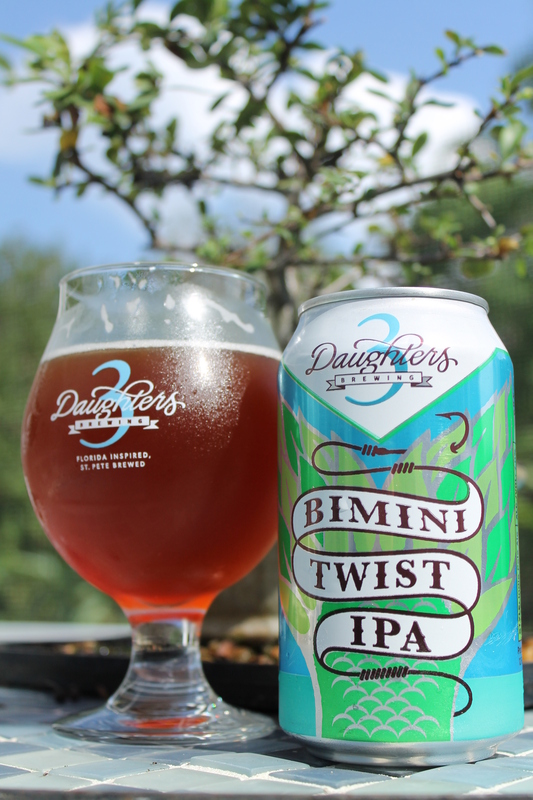 Last week The Nicoles went to 3 Daughters Brewing for our final Travels, Tours & Tales column while working together at the Osprey Observer. 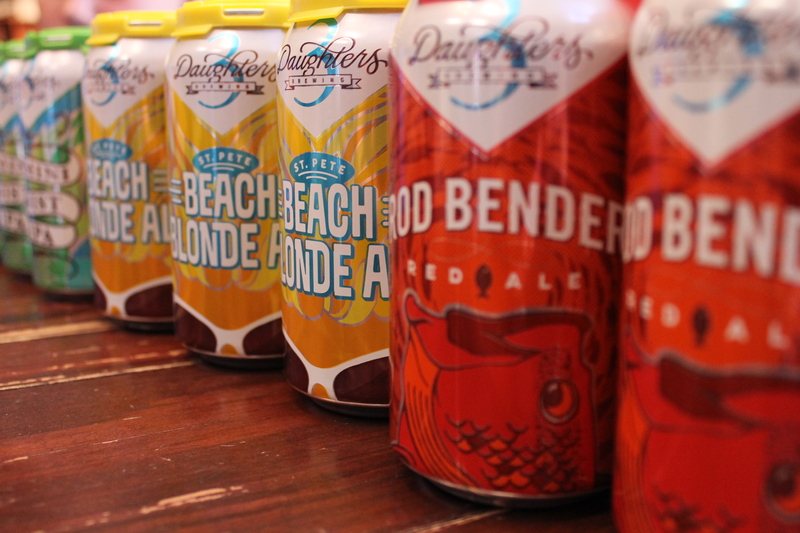 We took home a six-pack of each of their three most popular brews: Beach Blonde Ale, Bimini Twist IPA & Rod Bender Red Ale. They are all higher in ABV with 5%, 7% and 5.9% respectively. I think my favorite was the Beach Blonde Ale that had this really pretty yellow color to it. Although they were all different styles, they were all fairly hoppy, more so than I expected. The prices are reasonable at about $8 a six-pack and they are available at most grocery and convenient stores. While we were at the brewery we also got a flight for $6.50 which included four 6 oz. pours from the tap line-up. I don’t remember exactly which four I picked, I think it included El Hefe, Saison Lafayette and Belgian Dark Strong, but I remember liking them all more than the three canned styles we took home. I believe they have over 64 different styles of beer, not all of which are in bottles. It was a really cute place in the art district of St. Pete with homemade pieces around the bar including a mural from local artists the Vitale Brothers. I love that the couple named the business for their three young daughters since they will be using the proceeds to put them through college. It makes me feel like i’m supporting a noble cause when I purchase their beer. They have a ton of board games, ping pong, darts and more right in the storehouse where they brew and host live music on the weekends plus food trucks. I will definitely have to make my way over there on a Friday night s ometime soon. I recently had the opportunity to go on a tour for 15 days in Israel. The tour was packed full of events but I still found a few moments to try two of the main beers they had at the hotels. 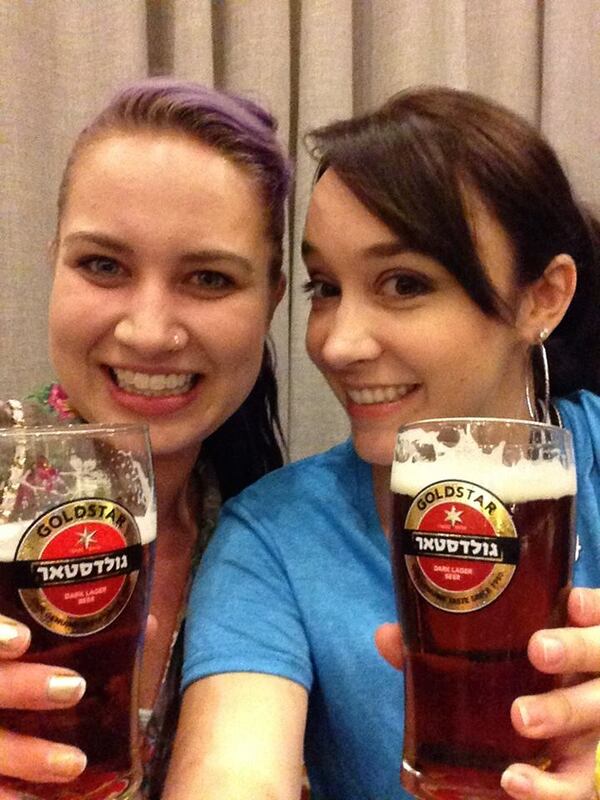 The first was called Goldstar, which is Israel’s best-selling beer. It was not bad, but not my favorite beer ever. It’s a red lager at 4.9% and straight off the tap from the bar at the Olive Tree Hotel in Jerusalem was nice after a long, hot day. The second beer we had ordered up to the room on the last night in Jerusalem at the Leonardo Hotel was the Maccabee beer. 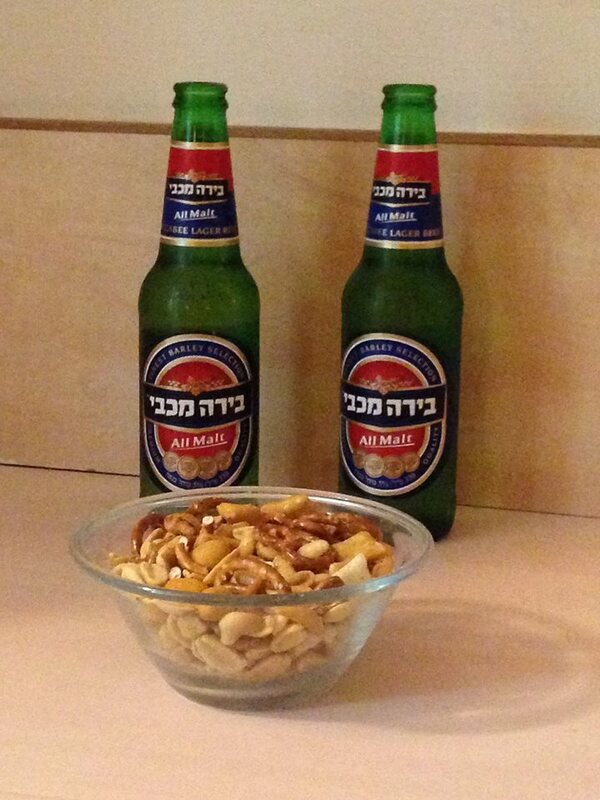 This is a pale Israeli lager and is apparently dubbed as “Israeli’s official alternative beer,” whatever that means. It reminded me a lot of Heineken. It’s 7.9% abv and if I remember correctly it cost 12 or 20 shekels, which was about $5. I believe it was about the same for the Goldstar, maybe a little more because it was 24 ounces. Bazelet Amber Ale at 6.4% from the Golan Brewery. This really wasn’t anything special. 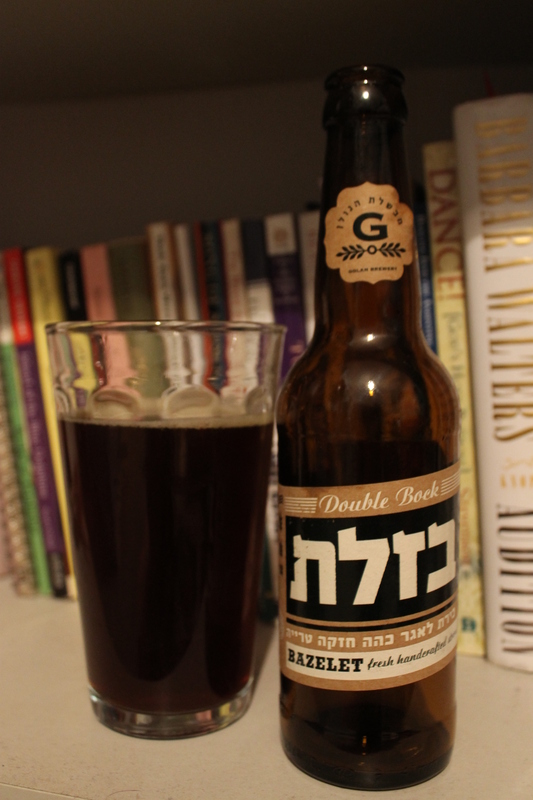 Bazelet Double Bock from the Golan Brewery. Very smooth and complex. Bazelet OG Blonde Wheat. The sign at the store said it was seasonal. It had a great buttery smoothness, it was wonderful.